A rare copy of the first Superman comic, dating from 1938, has sold at auction for $317,200 (£227,000). The online auction started two weeks ago and attracted 89 bidders. Neither the buyer nor the seller were named. The copy was described as unrestored. 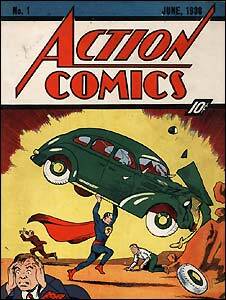 The cover shows the cape-wearing action hero from the planet Krypton lifting a car above his head. There are only 100 copies left of the first Superman comic, which sold for 10 cents when it appeared in June 1938. Stephen Fishler, the owner of the online auction site Comic Connect said the Superman comic had been in the same hands since 12 years after it was published, when a young boy on the US west coast bought it for 35 cents. He then forgot about it until 1966 when it emerged in his mother's basement. He held on to since then, hoping it would gain in value, Mr Fishler told CNN. He said before the auction the comic might fetch as much as $400,000. Superman is generally recognised as the first superhero to appear in comics - predating the likes of Spider-Man and Batman. The crime fighter's secret alter ego is Clark Kent, a mild-mannered, bespectacled reporter for the The Daily Planet, who dashes into phone booths to change into Superman. The now-dilapidated house in Cleveland, Ohio where writer Jerry Siegel and illustrator Joe Shuster created Superman sold in an online auction last October for $100,000 (£71,000).